H. G. Wells’s powerful 1898 novel, The War of the Worlds, described angry, ugly Martians with immense eyes, quivering mouths, and slithering tentacles. “Those who have never seen a living Martian can scarcely imagine the strange horror of its appearance,” wrote Wells, whose novel also served as the basis of a 2005 Steven Spielberg remake starring Tom Cruise. 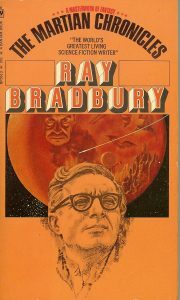 Bradbury’s Martians were intellectually, technologically, and telepathically superior to the lowly Earthlings, who colonized and exploited Mars only after having destroyed their own planet with nuclear bombs. They even took their destructive ways along with them into space, unintentionally wiping out much of the Martian population with chicken pox. As America embarked upon its space race in the 1960s, Bradbury’s good-aliens approach would influence novels, movies, and TV shows like 1963’s My Favorite Martian, which portrayed interplanetary visitors as average guys who looked and acted just like us. Bradbury’s close friend Gene Roddenberry would enthusiastically celebrate cosmic diversity in his Star Trek series. The Soul of Star Trek site has a brief article about the Bradbury-Roddenberry connection. Christian writer C. S. Lewis added a theological dimension to the good-Martian/bad-human approach in Out of the Silent Planet, the first installment in his space trilogy. Lewis portrayed Martians as sinless residents of an unfallen planetary Eden. 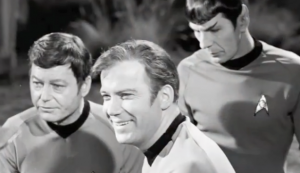 Dave and I are honored that Star Trek debuted 50 years before our book Star Struck came out. Just as Roddenberry celebrates cosmic diversity, we’re celebrating cosmic discovery and exploration. 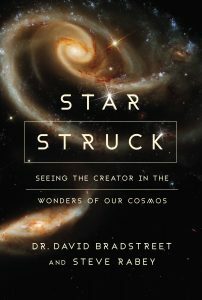 We’re sending a message that God loves scientists and the fascinating work they do. Perhaps 50 years from now, or less, this approach will have replaced the anti-science stances embraced in some circles.